Let’s start with criterion. This is actually the broadest concept of the four. Criteria are standards with which we evaluate things. When you meet someone new, you may be using ‘happy’ as a criterion for evaluating the other person. Values are criteria too, but they are very important criteria. ‘Honesty’ might be a value when you meet someone new. If they don’t seem very happy, you might not worry about that too much. But if they strike you as dishonest, you might think twice about meeting them again. All depending on your criteria, of course. There its a sliding scale between ‘Criterion’ on the one end and ‘Value’ on the other. As a criterion becomes more and more important, at some point we call it a value. So when we ask ‘What do you find most important in this situation?’ we are asking about values. Meta Programs are ways in which you handle your values. For instance: are you presupposing people will be honest (matching) or are you presupposing they will be dishonest (mismatching)? Graves Drives are a typology of criteria. 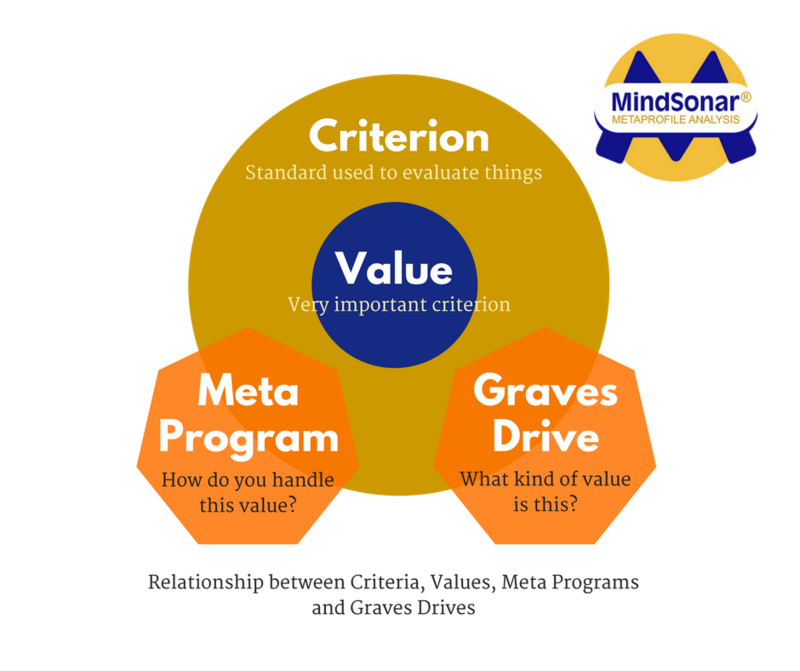 In MindSonar we assign values to a certain drive, making it easier to compare them with other criteria. For example: is honesty about power for you (red drive)? Or is it about community (green drive)? If somebody else had ‘Openness’ as a value, would that be similar to honesty or not? We can’t know from looking at the words ‘honesty’ and ‘openness’. But if we know that two people both categorise their differently labeled values in the same Graves Drive, we know that their values are similar. b. Problems with the previous set of values. MindSonar measures the extent to which someone’s criteria are associated with seven of the eight Graves Drives. We call this ‘Graves categorisation’: putting someones criteria (already formulated) into a Graves category. This makes it possible to compare criteria between people or between different situations for the same person. Clare W. Graves was a professor of Psychology in the sixties and seventies of the 20th century at Union College in New York, the same university where Abraham Maslow taught at the time. Maslow was developing his motivation theory (Maslow’s pyramid of needs), which shows the development of individual needs. The highest level of Maslow’s hierarchy, ‘self-actualization’, fit right in with the prevailing views of the seventies. Graves thought this model did not offer a broad enough base for understanding man as a bio-psycho-social-cultural being. He assumed that human behaviour was not determined by individual needs alone, but by a combination of social, biological and psychological factors. Graves theorized that there are eight value systems which evolved over the course of the past 100,000 years of human history. Graves called these value systems ‘Levels of existence’.